The universe suddenly looks a lot more crowded, thanks to a deep-sky census assembled from surveys taken by NASA’s Hubble Space Telescope and other observatories. In analyzing the data, a team led by Christopher Conselice of the University of Nottingham, U.K., found that 10 times as many galaxies were packed into a given volume of space in the early universe than found today. Most of these galaxies were relatively small and faint, with masses similar to those of the satellite galaxies surrounding the Milky Way. As they merged to form larger galaxies the population density of galaxies in space dwindled. This means that galaxies are not evenly distributed throughout the universe’s history, the research team reports in a paper to be published in The Astrophysical Journal. “These results are powerful evidence that a significant galaxy evolution has taken place throughout the universe’s history, which dramatically reduced the number of galaxies through mergers between them — thus reducing their total number. This gives us a verification of the so-called top-down formation of structure in the universe,” explained Conselice. One of the most fundamental questions in astronomy is that of just how many galaxies the universe contains. The landmark Hubble Deep Field, taken in the mid-1990s, gave the first real insight into the universe’s galaxy population. Subsequent sensitive observations such as Hubble’s Ultra Deep Field revealed a myriad of faint galaxies. This led to an estimate that the observable universe contained about 200 billion galaxies. The new research shows that this estimate is at least 10 times too low. Conselice and his team reached this conclusion using deep-space images from Hubble and the already published data from other teams. They painstakingly converted the images into 3-D, in order to make accurate measurements of the number of galaxies at different epochs in the universe’s history. In addition, they used new mathematical models, which allowed them to infer the existence of galaxies that the current generation of telescopes cannot observe. This led to the surprising conclusion that in order for the numbers of galaxies we now see and their masses to add up, there must be a further 90 percent of galaxies in the observable universe that are too faint and too far away to be seen with present-day telescopes. These myriad small faint galaxies from the early universe merged over time into the larger galaxies we can now observe. “It boggles the mind that over 90 percent of the galaxies in the universe have yet to be studied. Who knows what interesting properties we will find when we discover these galaxies with future generations of telescopes? 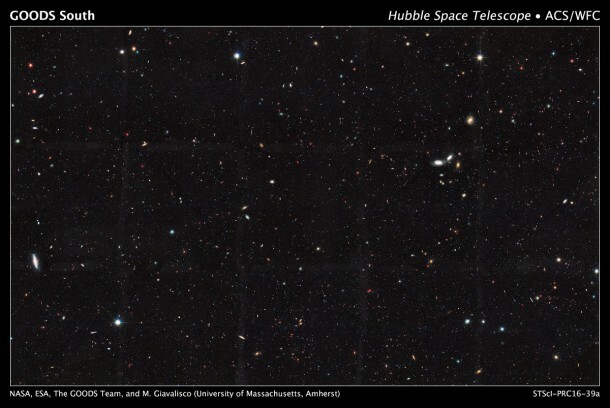 In the near future, the James Webb Space Telescope will be able to study these ultra-faint galaxies,” said Conselice. The decreasing number of galaxies as time progresses also contributes to the solution for Olbers’ paradox (first formulated in the early 1800s by German astronomer Heinrich Wilhelm Olbers): Why is the sky dark at night if the universe contains an infinity of stars? The team came to the conclusion that indeed there actually is such an abundance of galaxies that, in principle, every patch in the sky contains part of a galaxy. However, starlight from the galaxies is invisible to the human eye and most modern telescopes due to the other known factors that reduce visible and ultraviolet light in the universe. Those factors are the reddening of light due to the expansion of space, the universe’s dynamic nature, and the absorption of light by intergalactic dust and gas. All combined, this keeps the night sky dark to our vision.